1. Through metastatic progression breast cancer cells undergo epithelial-mesenchymal transition (EMT) and the reverse process of mesenchymal-epithelial transition (MET). 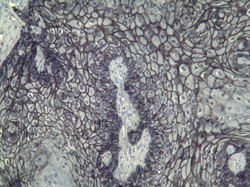 An overriding hypothesis in the lab is that through the processes of EMT:MET the secondary epithelial state that characterizes the metastatic tumor is fundamentally unique from the epithelial status of the primary tumor. We believe these differences hold the keys to developing therapeutics capable of treating metastatic lesions. 2. Subsequent to dissemination, a large fraction of tumor cells enter into an asymptomatic state of dormancy. The ability of normal organs to resist secondary tumor formation is the body’s last defense against metastatic disease progression. The environmental factors (drugs, alcohol, diet, exercise, etc…) involved in “awaking” of disseminated tumor cells are poorly characterized. Understanding of these factors is required if we hope to design therapeutics capable of maintaining systemic disease in an asymptomatic state of dormancy. Fibroblast growth factor receptor (FGFR) is a key player in EMT and breast cancer progression. The biology of FGFR is complicated by numerous changes in expression and mRNA splicing that take place during EMT. There are currently several collaborative projects in the lab aimed at improving both FGFR based diagnostics and therapeutic targeting of this critical signaling pathway. Recent work in the lab has established that overexpression of EGFR is capable of transforming mammary epithelial cells. However, following EMT and metastasis EGF signaling switches to an apoptotic event. The clinical implications of this paradoxical function of EGFR are significant. Currently, there are several projects in the lab investigating the underlying molecular mechanisms that facilitate the "EGFR paradox." Targeted therapies that act upon the growth factor receptor Her2 are a well established treatments in breast cancer as ~25% of patients display amplification of this receptor. Inherent and acquired resistance to these therapies remains a major clinical obstacle. We are employing several models of Her2-therapy resistance, including patient-derived xenografts to devise protocols capable of increasing the durability of this important clinical target. Maintaining tumor cell dormancy, as opposed to total tumor cell eradication, presents an alternative therapeutic strategy for the management of systemic disease. Several novel model systems in the lab allow us to define environmental and molecular mediators of systemic tumor dormancy. We use a combination of molecular, biochemical, cell biological and whole animal studies to evaluate the impact of anticancer therapies on EMT induction and metastatic progression. Specifically, we utilize a variety of 3D and multicellular colculture models to evaluate growth factor signaling, pharmacological response to anti-cancer drugs, and as a platform for genetic and compound screening assays. In addition to these in vitro approaches we have developed novel in vivo mouse models of metastasis and drug resistance. We utilize these models in combination with bioluminesent imaging as a robust approach to locate and quantify metastatic progression.